Robert M. Bernstein, M.D., F.A.A.D., a world-renowned hair transplant pioneer, has presented two advances in robotic hair transplant surgery to the hair restoration industry’s largest conference; an interactive hair restoration design software suite called ARTAS Hair Studio™ and recipient site creation capability in the ground-breaking ARTAS® Robotic Hair Transplant system. Dr. Bernstein’s presentation highlights the fact that the ARTAS System is the first system to integrate the planning and performance of a hair transplant procedure. Dr. Bernstein presented these new technologies at the 22nd Annual Science Meeting of the International Society of Hair Restoration Surgeons (ISHRS) in Kuala Lumpur, Malaysia, on October 11th, 2014. ARTAS Hair Studio is a planning tool that assists the physician in the design phase of the hair restoration procedure. Dr. Bernstein’s presentation described how this software enables the physician to generate a three-dimensional model of the patient’s head and then create a treatment plan based on parameters such as the number of recipient sites, the angle of elevation of the hairs, and the direction of the hairs. With small modifications of the software, the technology can add “virtual” hair to the 3-D model and allow patients to see how the results will actually look. This will create a more interactive, educational experience for the patient and one that helps align the patient’s expectations with what is possible given their specific hair loss characteristics. In his presentation to the ISHRS, Dr. Bernstein described several advantages of robotic site creation over manual site creation, including: the elimination of inconsistencies in creating large numbers of recipient sites by hand, precise distribution of follicular unit grafts, automatic adjustment to site densities, and automatic avoidance of existing hairs without sacrificing speed. 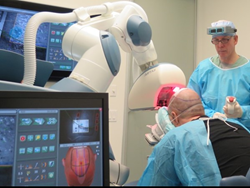 The robot uses advanced sensory equipment and optical cues to locate potential recipient sites on the scalp and then quickly and accurately make the incisions based on the pre-programmed parameters. The robot can create up to 2,000 recipient sites in approximately one hour. Dr. Bernstein noted that these advances represent an integration of the design and planning processes with the actual performance of the procedure. Whereas in the past, the doctor would describe the treatment plan to the patient and then manually implement the prescribed plan, today’s computerized robotic system allows the physician to digitally design the hair transplant treatment plan, and then that plan directs the robot in the operating room. Dr. Bernstein’s published articles on follicular unit hair transplant procedures have been called “Bibles” for the industry. He has received the Platinum Follicle Award, the highest honor in the field. He is a fellow of the International Society of Hair Restoration Surgery (ISHRS). Dr. Bernstein has appeared as a hair restoration expert on many notable television programs and in many news and lifestyle publications over the years. Examples include: The Oprah Winfrey Show, The Dr. Oz Show, The Today Show, Good Morning America, ABC News, CBS News, New York Times, Wall Street Journal, Men’s Health Magazine, and more. He is co-author of Hair Loss & Replacement for Dummies. Dr. Bernstein graduated with honors from Tulane University, received the degree of Doctor of Medicine at the University of Medicine and Dentistry of NJ, and did his training in Dermatology at the Albert Einstein College of Medicine. Dr. Bernstein is a Clinical Professor of Dermatology at Columbia University. Bernstein Medical – Center for Hair Restoration, the facility Dr. Bernstein founded in 2005, is dedicated to the diagnosis and treatment of hair loss in men and women using the most advanced technologies. The state-of-the-art facility is located in midtown Manhattan, New York City and treats patients from around the globe. In 2011, Bernstein Medical became one of the first practices in the world to offer Robotic FUE procedures using the image-guided, computer-driven technology of the ARTAS Robotic System. Bernstein Medical is a beta-testing site of the robot’s new capability including the creation of recipient sites and Dr. Bernstein is a medical advisor to the company that produces the robotic system, Restoration Robotics, Inc. The board-certified physicians and highly-trained clinical assistants at Bernstein Medical take pride in providing the highest level of treatment and care for all patients.